It sounds very peculiar at first, but it is a logical extension of brewers' efforts to prevent unscrupulous scalpers from making obscene profits re-selling highly prized beers. Several prominent brewers have been vocal about their opposition to beer auctions on Ebay for quite some time. Lost Abbey's Tomme Arthur penned an article called *&^% Ebay about four years ago, and last year an article in the Washington Post interviewed several brewers about the problem. Stone's founder Greg Koch was quoted in that article as saying "We have involuntarily been a part of the eBay aftermarket for many years". Since then, Stone and Lost Abbey have hit on a clever solution to the problem. Henceforth, their rare beers will be subject to End User License Agreements, similar to those you might be familiar with if you use computer software from companies like Microsoft or Apple. 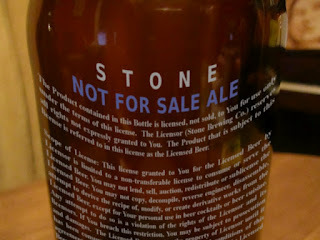 The first beer of Stone's to be sold under a "Beer End User License Agreement" -- BEULA for short -- is a rich and flavorful triple IPA along the lines of Russian River's vaunted Pliny the Younger, aptly named "Not For Sale Ale". Whereas the back of a typical Stone bomber is adorned with several paragraphs of whimsically rambling boasts, NFSA's bottle (click on the picture for a closer look) is embossed with a dense legal contract that stipulates -- among other things -- that purchasers "may not lend, sell, auction, redistribute or sublicense" the beer, and that the beer may not be used in "the development, design, manufacture or production of nuclear, chemical, or biological weapons". Click here for the full text of Stone's BEULA. As a fan of good beer, I have inveighed against Ebay beer scalpers for quite awhile -- I even auctioned an empty Abyss bottle once to demonstrate what a joke it is for beer auctioneers to skirt Ebay's rules by claiming that the bottle itself is what's valuable, not the beer inside. Even so, I confess that I'm a little uncomfortable with treating beer as intellectual property in this way. Aside from the essentially coercive nature of EULAs and BEULAs, the legalese in the contract goes against the convivial spirit of the beer world. There is also the practical question of how to enforce a BEULA, though I suspect that having the prohibition printed right on the bottle might finally convince Ebay to be more proactive about shutting down beer auctions. Several more California brewers are rumored to be working with lawyers to prepare BEULAs for future releases, starting with the next offering for Lost Abbey's Saints and Sinners club. The Bruery and Russian River are likely to be the next breweries to follow suit -- the Bruery's license allegedly goes so far as to prohibit the use of its beers in so-called beer cocktails. Russian River seems to be taking it a little more slowly -- supposedly they will try out their new BEULA on this year's bottling of Objectification, a lighter beer unlikely to attract much collector interest anyway. What's your opinion? Are beer license agreements a legitimate and reasonable way to combat beer profiteering? Or are they an unwarranted intrusion into our enjoyment of quality fermented beverages? I guess I just don't understand what the problem is. Or rather, I suppose I have a different understanding of what 'owning' something is. I buy it, it's *mine now* and nobody gets to tell me what I do with it. Old school, I know and flies in the face of all the EULAs and crap that's going around but that's still where I come in on it. You sell me a beer, it's no longer any of your business what I do with it. Don't have to like that but don't think that telling someone that something they own is 'not for sale' is going to stop anyone from making these kinds of transactions. @Grotusque: Yeah, I'm against EULAs myself, but it's like so many things nowadays: if you want to play in mainstream society, you end up accepting them. The insurance racket is another example. So I'm not happy to see EULAs in the beer world, but on the other hand, I have no respect for scalpers of any kind, especially those willing to explicitly lie about what they are auctioning, simply for the convenience of being able to auction it. $150000 Bordeaux. Guys really? You produced something in limited edition so it is naturally more valuable the longer it lasts and the closer it becomes to being the last copy left. There was only 1 Mona Lisa produced hence it's extraordinary price. There were only a couple thousand '54 bordeauxs produced and there were only a couple thousand cases of vertical epics produced, it's not a black market it's following expected economic principles. These secondary markets will exist as long as consumers can justify paying extraordinary prices for the goods they desire. The mentality continues to move towards, "Oh it's limited?? I don't know what it tastes like but I want it!" DLD tix on stubhub for $250 is just crazy and goes against everything craft beer stands for. But sadly someone will pay $250 for that ticket so I don't know if I can blame the seller. I agree with BEULA's in theory but I really don't think the issue will go away until the BUYERS stop paying these prices. I hate to see beer go this way. In a way I think craft beer may have inadvertently created a monster...and I think this is just the beginning. I for one will continue to homebrew and get what I can of the commercial releases I love. But if I can't get one, life goes on. The value of Stone beer just shot through the roof which is what Stone is attempting to thwart. Koch is jealous that Stone is not receiving 100% of the cash value. They're forgetting the PR and brand value. Well, I'm flattered that this little April Fool's article rang true enough to get a few serious comments. I don't think beer will ever be licensed like this, but brewers that wanted to slow Ebay auctions could start putting "VALUABLE BEER -- VALUELESS BOTTLE" in big letters on the label, so Ebay could easily see when "collectible bottle" auctions violate their no beer policy.